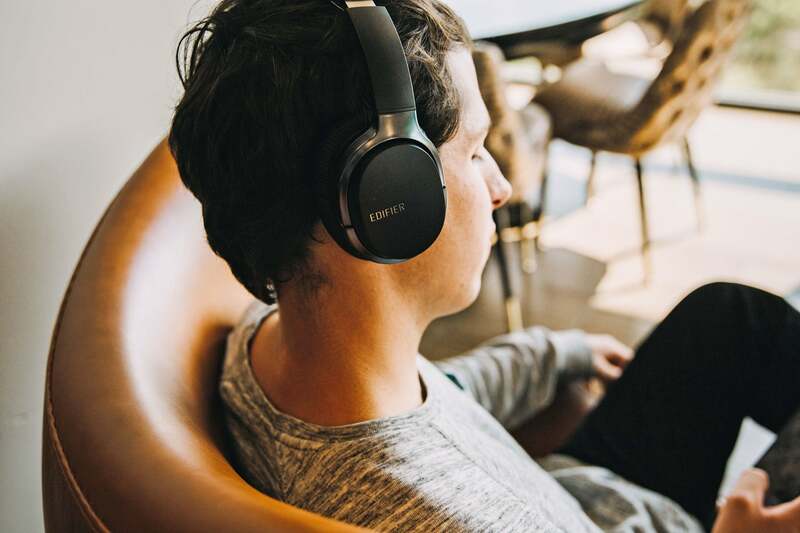 Headphones with active noise cancellation (ANC) allow you to retreat from the din of modern life. And who doesn’t want to do that now and then? Even better, you can listen to your favorite tunes at lower levels, thus protecting your hearing. 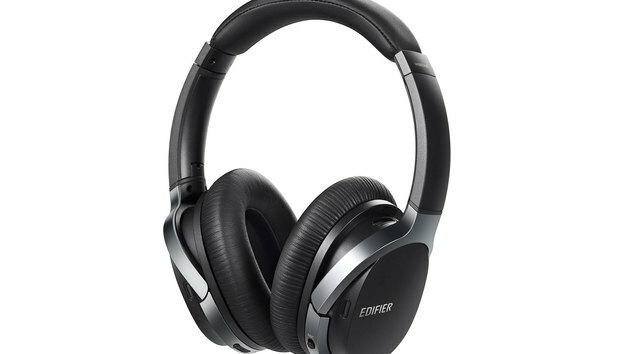 After thoroughly testing Edifier’s W860NB ANC headphones, I can say they’re better for the former than the latter. 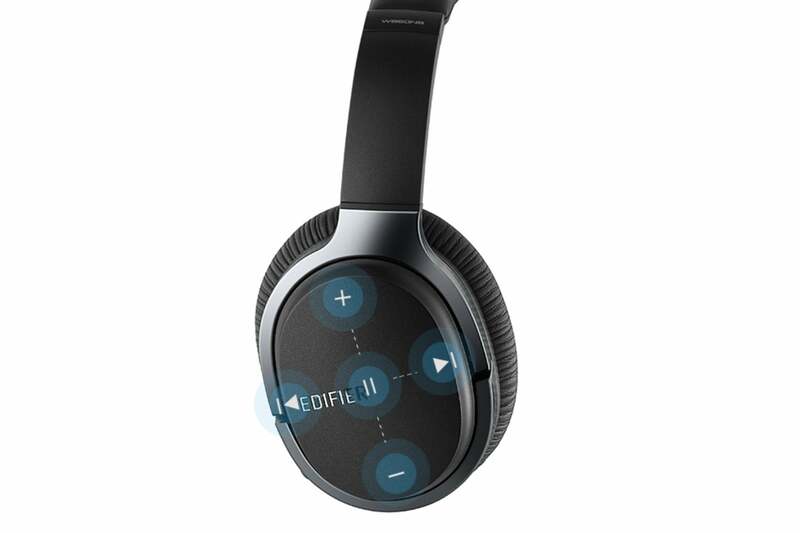 The Edifier W860NB is an over-ear (circumaural) Bluetooth headphone with artificial-leather earpads and headband, weighing in at just over 10 ounces. It utilizes 40mm drivers with neodymium magnets to achieve a specified frequency response from 20Hz to 20kHz (no tolerance given). 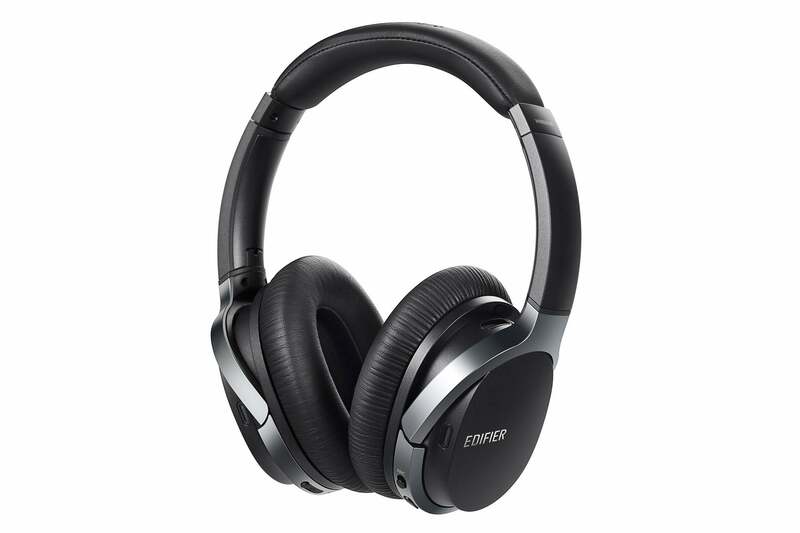 As mentioned at the top, the W860NB offers active noise cancellation. Four microphones, two in each earcup, sample ambient noise, which is then phase-inverted and mixed with the original signal to reduce the perceived level thanks to phase cancellation. (There’s also a fifth mic for phone calls.) Unfortunately, the W860NB has no transparency mode, which would temporarily disable ANC so you can hear things in your environment, such as safety instructions in an airplane. Wireless headphones like the W860NB offer freedom from wires that usually end up in a tangled mess. The W860NB supports Bluetooth 4.1 with the HSP, HFP, A2DP, and AVRCP profiles, and it supports the high-quality aptX codec. In addition to conventional pairing with Bluetooth sources, it can be paired with devices that support NFC (Near-Field Communication). In that case, all you have to do is hold the W860NB close to the source device and accept the connection. The only other audio input is a 3.5mm two-channel analog-audio jack at the bottom of the left earcup. When you connect to a source using such a cable (which is included with the W860NB), the headphone powers off, becoming a passive headphone with an impedance of 32 ohms. This is great news if the battery is dead but you still want to listen. The W860NB comes with a nice hardshell case. You charge the internal battery by connecting any USB power source (5V, 500 mA) to the microUSB connector near the bottom of the left earcup. A suitable cable is included with the headphone, but the connector is hidden behind a small plastic cover that seems certain to break off and get lost in short order. Charging takes about four hours, after which the battery will last about 25 hours with ANC engaged or 45 hours without ANC. That’s a very long battery life! 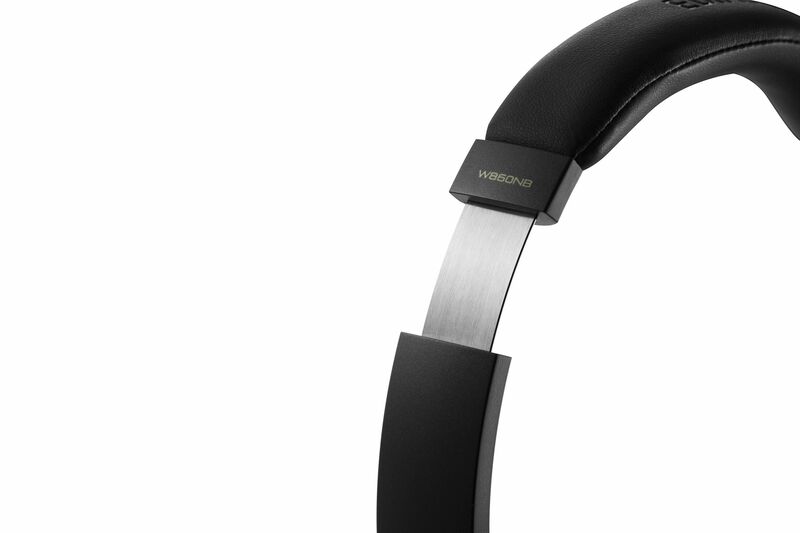 Like most such headphones, the W860MB lets you answer phone calls while listening to music. In that case, the music pauses during the call, and then resumes when you hang up. 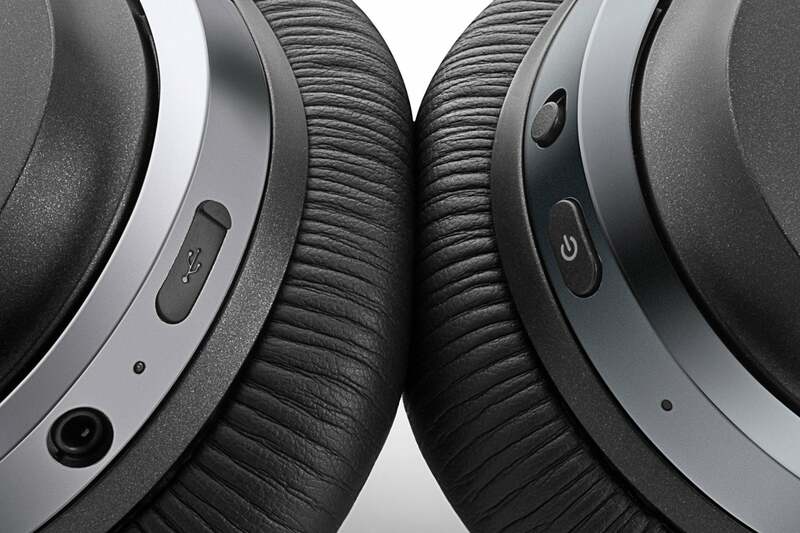 The only buttons on the W860NB are found near the bottom of the right earcup. They include the power button—which is actually a multifunction button—and a sliding toggle to turn ANC on or off. Aside from turning the power on and off, the multifunction button can also be used to answer, reject, and hang up phone calls as well as enable and disable the source device’s voice-assistant function (e.g., Siri in iOS devices). All other functions—play/pause, volume up/down, and skip forward/back—are controlled with the touch-sensitive surface of the right earcup. To play or pause music, double tap in the center of the earcup. Slowly slide your finger up or down along the surface of the earcup to increase or decrease the volume, and slide your finger forward or backward to skip to the next or previous track. If you get a call while listening, you can double tap the center area to answer the call and hang up when you’re done. Hold your finger in that area for about two seconds to reject the call. The bottom of the left earcup holds a 3.5mm analog-audio input, charging-indicator LED, and microUSB charging port under a flimsy cover. The bottom of the right earcup holds a status-indicator LED, power/multifunction button, and ANC on/off slider. Pairing the W860NB with my iPad was no problem. I started my listening with “Blue Skies” from the album Cassandra Wilson Sings Standards; this tune includes only acoustic bass and drums accompanying Wilson’s voice. Overall, the sound was a bit thick, and the bass was somewhat bloated, but the voice was rich and fulsome. Next up was “Chicha” from the album Tales From Home by acoustic guitarist Ciro Hurtado. This track includes electric bass, drums, flute, and synthesizers in addition to guitar. The instruments were well balanced with full-sounding guitar, and the bass wasn’t as boomy. The overall sound, however, was somewhat congested and closed in. Remaining south of the border, I played “Los Laureles” from Linda Ronstadt’s Canciones de Mi Padre. The instrumentation includes a full Mariachi band with violins, trumpets, guitarron, and harp. Ronstadt’s gorgeous voice was nice and forward, but the overall sound was somewhat veiled with slightly boated bass. “Wooden Ships” by Crosby, Stills & Nash is a strange mix for headphones, with the two solo voices hard-panned right and left. As rendered by the W860NB, the sound seemed quite veiled, especially the vocals, and the bass was a bit indistinct and boomy. One of my favorite world-music artists is Jai Uttal and the Pagan Love Orchestra. “Guru Brahma” on the album Shiva Station includes sitar, electric bass, drums, tablas, guitar, organ, synths, and muted trumpet supporting Uttal’s vocals. The bass was way overblown, while the voice and sitar were rich and in your face. The surface of the right earcup provides touch-sensitive controls: play/pause/answer phone by double-tapping the center, increase or decrease the volume by sliding a finger up or down, and skip to the next or previous track by sliding a finger forward or backward. Unfortunately, the volume and skip-track controls do not work very well. I also listened to “Croque Monsieur” from the album French Cafe: A Parisian Gypsy Jazz Swing Experience by Paris Cafe Society. This track includes clarinet, violin, guitar, acoustic bass, and percussion, all of which sounded rich and full. The bass was a bit boomy, but not as bad as some of the other tracks I listened to, and the clarinet and violin were well defined. The overall sound, however, was still somewhat thick and congested. Turning to classical music, I listened to “Wie Lieblich Sind Deine Wohnungen” from Brahms’ Ein Deutsches Requiem as performed by Collegium Vocale Gent and the Orchestre des Champs-Elysees under Philippe Herreweghe. The sound here was well balanced between the orchestra and choir, but it sounded a bit congested and veiled overall. Joshua Bell is among the world’s preeminent violinists, as he aptly demonstrates playing Tchaikovsky’s Meditation in D Minor with the Berlin Philharmonic under Michael Tilson Thomas on the album Tchaikovsky. The orchestra sounded full and well balanced, but the violin was somewhat recessed, which could have been the mix of that particular track. For some chamber music, I listened to the first movement of Brahms’ “Trio in A minor, Op. 114” as performed by Yo-Yo Ma on cello, Emanuel Ax on piano, and Richard Stoltzman on clarinet from the album Brahms; Beethoven; Mozart Piano Trios. Each instrument was well defined, but the overall sound was somewhat veiled, and the bass was boomy. 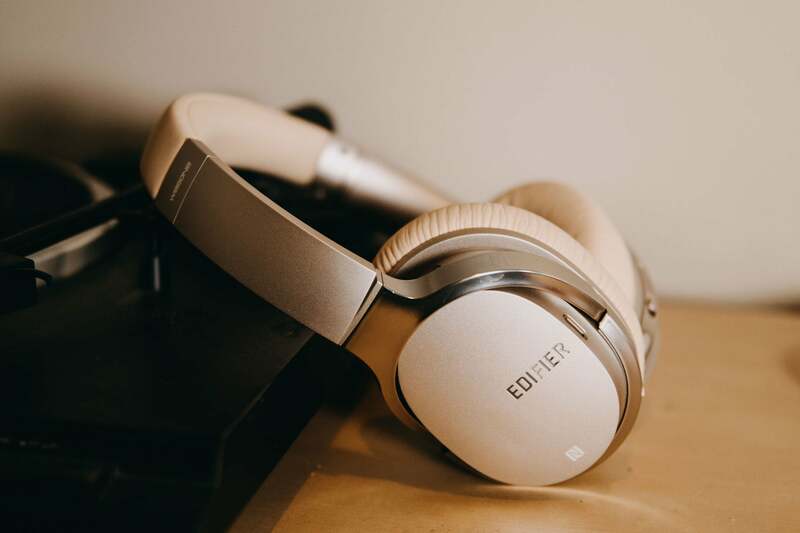 The Edifier W860NB are also available in tan finish, but it’s still faux leather. During my listening, I played with the touch-sensitive controls of the W860NB. Double-tapping the right earcup starts and pauses playback as expected. There’s a long delay, however, between sliding your finger up and down on the right earcup and a change in volume; I found it nearly impossible to set the volume I wanted using that control. Sliding my finger forward and backward across the right earcup is supposed to skip to the next or previous track. But this was very unreliable; it would often skip two or three tracks. The touch-sensitive controls are a good idea, but this implementation needs work. I listened to each selection twice—once on the W860NB and again on the PSB M4U 8 that I recently reviewed. The boomy low end and veiled, closed-in sound quality of the W860NB was all the more obvious when compared to the M4U 8, which invariably sounded much clearer and more open with no bass bloat. Also, the M4U 8 was louder at a given volume setting. Granted, the M4U 8 costs more than twice as much as the W860NB, but still…. In addition, I found the W860NB to be less than perfectly comfortable to wear. It didn’t easily conform to my head; I had to manually rotate the earcups for a good seal. In addition, the build quality feels pretty cheap, and after a while, I started sweating under the artificial-leather earpads. The Edifier W860NB’s build quality feels cheap. 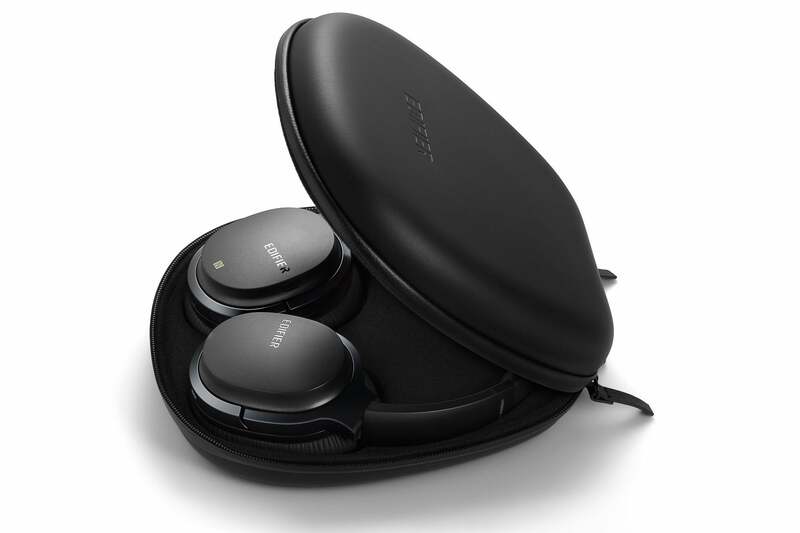 Regarding active noise cancellation, the W860NB actually exhibited less hiss than the M4U 8 when I engaged ANC in a quiet room. Taking them both driving around my neighborhood, I started with comparing the ANC of each unit without any music. I found that the noise cancellation is at least as good in the W860NB—and perhaps a smidge better than the M4U 8. Even more interesting, I discovered that the W860NB actually sounds better with ANC on! Whereas the M4U 8 sounds a bit bloated with ANC on, the opposite is true of the W860NB. In fact, it sounded just a bit anemic, with much less low end than without ANC. I checked this when I got home in a quiet room, confirming my observations in the car. Just before I finished my evaluation, I had my wife call my cell while I was listening on the W860NB. Double-tapping the right earcup answered the call, and her voice sounded nice and clear. (She said the same about my voice.) I double-tapped the earcup again to hang up and resume listening. As I listened to the Edifier W860NB with ANC off, I was preparing to not recommend it; the sound quality is somewhat veiled and congested with boomy bass. Also, the build quality feels cheap, it’s not as comfortable as I would like, and the touch-sensitive controls don’t work very well. But then I tried it with ANC on, and the sound improved substantially—though in that case, it’s a bit lean, which I prefer over boomy. Even better, the battery is spec’d to last up to 25 hours with ANC on, which is much longer than most. By contrast, the M4U 8 specifies a battery life of around 15 hours, but its batteries can be replaced with two regular AAs in a pinch. And like the M4U 8, with the power off (say, due to a dead battery), the W860NB can act as a passive headphone using a 3.5mm audio cable, though with no ANC, the sound is back to being bloated. I still prefer the sound of the PSB M4U 8, at least with its ANC off. Plus, it has much better build quality, fully functional controls, and it’s more comfortable to wear for extended periods. But it’s more than twice as expensive as the W860NB. Speaking of the price, $169.99 is quite good for Bluetooth headphones with ANC. And until March 23, you can snag the W860NB for only $129.99 on the Edifier website. If money is tight but you want over-ear headphones with ANC, the W860NB is worth a serious listen—as long as you do so with ANC on.